If you have followed along and completed step one and step two, you have - believe it or not - already done most of the work in creating your own personal cook ahead plan. Well done! Today I am going to concentrate on the third and final step - Cooking and Freezing the meals . So back to our example. I have decided to make Italian beef vegetable soup, lemon chicken, and hamburgers. I've shopped and prepared my food and it's all waiting, ready for cooking. So what's next? 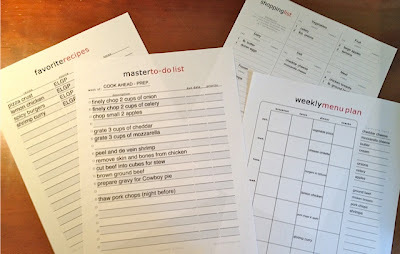 I will be using my Master To Do List form from YourWay.net again to make my cooking day To Do list, and again, I will be making one list for each recipe. 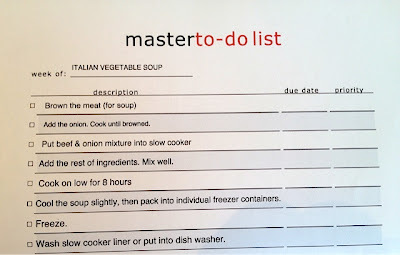 Let's use my Italian Beef Vegetable soup recipe again as an example. At this point, because all our ingredients are ready in the form required, we can just concentrate on the directions and copy these onto our lists. This is very straight forward. 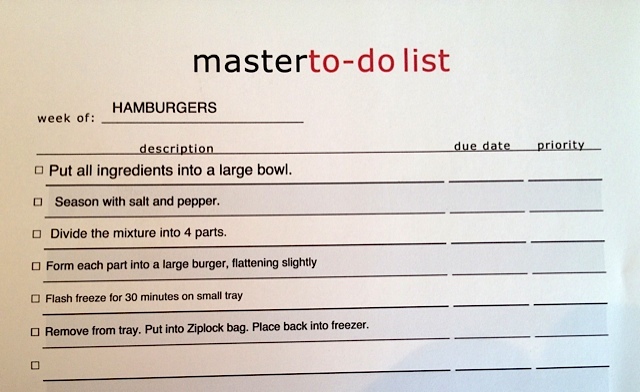 You just list everything else that needs to be done to finish the dish. 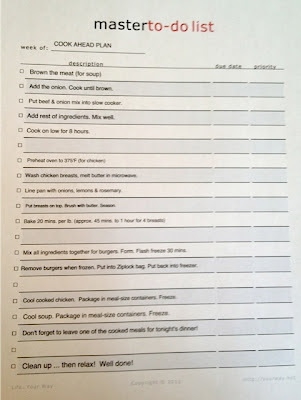 Here are the three lists for my dishes. 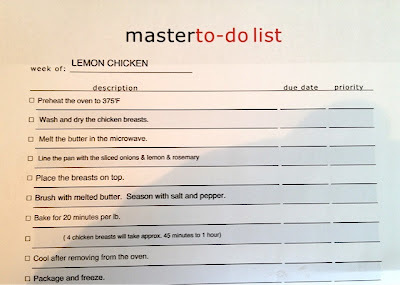 Once you have listed your recipe steps, think about how you will be freezing this dish and note that as well. If you will be eating part of it within the next couple of days you might want to keep one serving in an oven-proof casserole dish in your fridge. Some foods can be frozen easily in Ziplock bags. Others freeze better in containers. If you need some freezing ideas, check my post here. 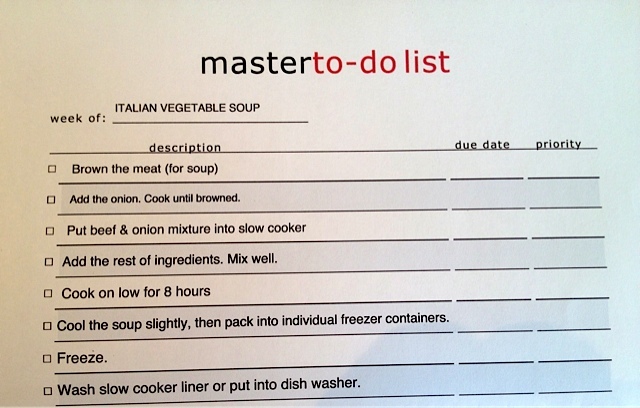 Once you have your three lists, you are again going to put them together into your Master Cook Ahead To Do List. This will require a little thinking - but not too much! If you have followed my suggestion and chosen one slow cooker, one oven and one prepare for later recipe it will be very easy. List all the slow cooker steps first. You want to get this going so it can be cooking while you do everything else. Next, prepare your oven dish and get that into the oven. Then, while both of these dishes are cooking, prepare your third dish. Since this dish doesn't require cooking, make it and then package it for your freezer. At this point your oven dish will probably be ready so you can take this out and cool it. While you are waiting for it to cool, start doing your clean up. Then pack the oven dish and freeze it. You can freeze food even if it is still warm. It won't harm your freezer or any of the other food in it, as long as your freezer is at least half full. You have now finished two thirds of your cooking! You have time to finish cleaning up and probably even have a cup of coffee or tea and take a well-deserved break. Once your final dish is done, you can pack and freeze that, pop the slow cooker liner into the dishwasher or into your sink to soak, and your pretty well finished! If you are making several oven cooked dishes, choose ones that can all be cooked at the same temperature, that way you can cook a couple at once. When dishes require different oven temperatures, cook the one at the highest heat first, then the next highest and so on. This way you won't be wasting time or energy reheating your oven. Try to always include at least one slow cooker dish. This can be put to cook at the beginning of your cooking session and will give you more meals for a minimum of effort. You can add a stove cooked meal to the three I suggest very easily, just make it something that doesn't require a lot of stirring. This will take up too much of your time and you will get very hot if you are also making something in the oven at the same time. Choose a soup or stew, prepare it first thing after your slow cooker meal, and cook it on a relatively low heat so you just need to check it once in a while and can concentrate on the rest of your cooking. One final suggestion - plan on eating one serving of your slow cooker meal or oven meal for dinner. After spending so much time in the kitchen you really don't want to be doing more cooking, and this meal is ready and waiting for you. Just add whatever sides you need and your ready to go. 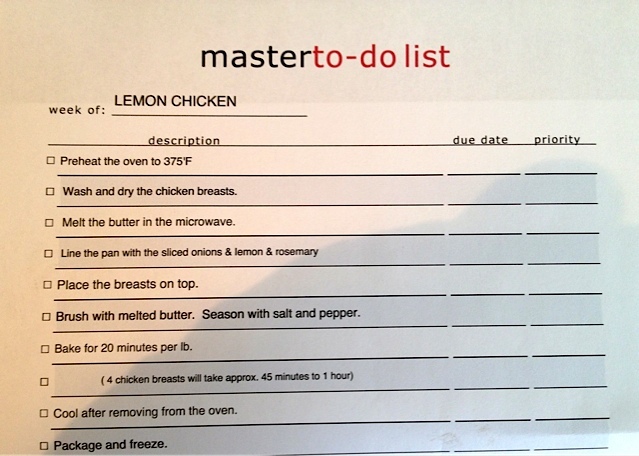 Make a cooking day list for each of your three recipes. 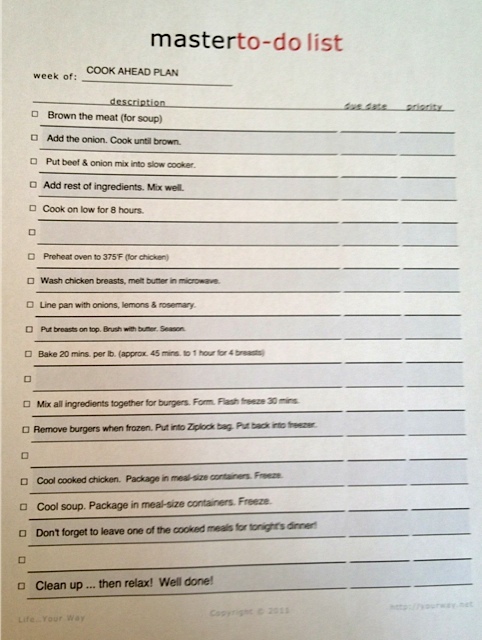 You've just created your first personal cook ahead plan. You can now file this away in your household binder and when you want to use it in the future it's ready to go. I suggest you set up two sections - one for Cook Ahead Plans and one for Recipe Plans. This way, when you want to make a different cook ahead plan using one or two of the same recipes, you will already have it partially done. All you have to do is follow the same process for the new recipes you want to add and then create your new plan. I hope you can see now that cooking ahead, if done step by step the way I've shown you, isn't difficult at all. It doesn't have to take up a lot of time either. 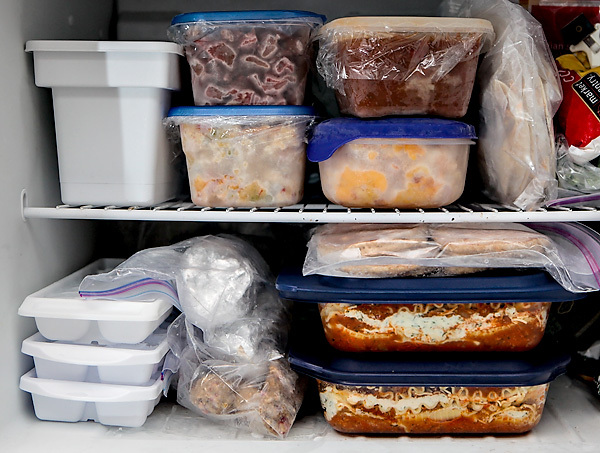 After a few sessions, your freezer will look like the one below and you will have lots of choices when you don't feel like cooking. However for some people, finding even a few extra hours a week for cooking ahead can be a challenge, so I have a few other options for you as well. Tomorrow I will show you the first one.